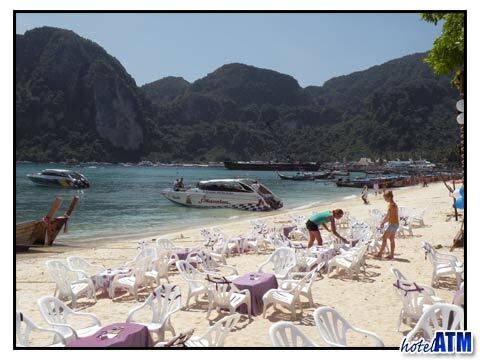 Located at the Tonsai beachfront near the Phi Phi Villa resort, you can enjoy a cool beer or a cocktail and during the day you gaze out onto the cliffs of Phi Phi Don or spy Phi Ph Ley in the distance. The Phi Phi Hippies Bar gives you an eclectic range of music from Sea Gypsies music, Rock n’ Roll to full on anthems and classics of the dance scene. Whether you motown, U2, P. Didi and want to Bump, Bump, Bump all night long, the Phi Phi Hippies Bar plays it all. Any night of the year can crank up to a full New year Eve emotion... pandemonium!!! At the Phi Phi Hippies Bar there is a fire show every night at 9 pm-11pm or some time starting at 11pm.... You'd think it was the highlight of the evening but as the tempo of the music climaxes, the fire show performers swirl their lit-up firebrands faster and faster, giving the onlooker an amazing high. As long as the music plays, they display their juggling skills keeping up with the tempo as if wired to the blaring music source. As the music slows down, the fire performers slow down their action. The whole sequence can make the onlooker a bit dizzy, but the firebrands continue to move at the beat of the music. They perform effortlessly and tirelessly, providing the much sought out entertainment for the night reveler. As the strobe lights at Phi Phi Hippies bar hit you, they will produce in you enough energy to boogie your way all through the night. The food and drinks are excellent. So if you want to see Phi Phi’s night life at its best, get to the Phi Phi Hippies Bar. The amazing topography of the Phi Phi Islands provides ample opportunity for day-time adventure sports. Diving and snorkeling are at its best. You have access to the best diving schools in South East Asia. You can also go in for rock climbing, kayaking, hiking, sailing. Other popular activities include sun bathing, relaxing, reading and eating. If however that's a bit too much, a bit bit too touristy for you, just kick back and enjoy a beer and watch the day go by at the Hippies bar beach.